In today’s weekly video tip we will discuss and demonstrate how to get the maximize video size in Video Surgeon and how to get the maximum frame size for printing, whether to paper or to a file (as an image). Click below to watch. We will soon release, hopefully by early next week, a new version of Video Surgeon. The version will allow user with small computer screens the ability to resize Video Surgeon to fit their screens. Once we have released this version, you will be able to find it at the help desk You can always find the most recent builds in the Downloads section of the Help Desk. YouTube, FaceBook or other social media websites. If you already have a video creation program that you like and are comfortable using, SlideTrax probably isn’t for you. But if you don’t own one, or find the one you own is too complicated or time consuming to make a Video then SLIDETRAX may be just your ticket. SlideTrax was created for its simplicity and ease of use. It has almost NO learning curve. Simply drag and drop your song or audio file onto the interface, drag and drop a picture you’d like to use and, if you’d like – add optional text. Then click the create button and PRESTO… in a couple of minutes you’ll have a video. We have begun to look at potential changes, modifications and new features for Video Surgeon Version 3. Though this version is at least 12-18 months into the future, we need to begin the planning process now. As always we want and need your input. Many of the features added to new versions come from input provided by our customers. Such input is vital to the success of the product. Please send me an email with any suggestions you may have for Version 3. Send to: info@videosurgeon.net. Thank you in advance. 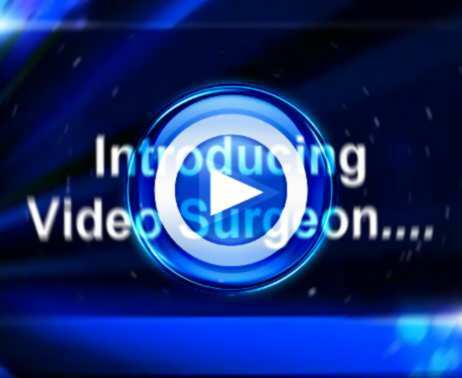 This Video Surgeon weekly tip is about resizing Video Surgeon. There are two situations to be addressed. The first is with small screens. Some older machines have lower resolution monitors and some of the newer, smaller, inexpensive notebooks have smaller screens. In these situations you may need to resize the Video Surgeon interface to its minimum size. Video Surgeon can be resized to a minimum size of 1000 x 800 with all of the controls showing and if the top and bottom areas are collapsed then it can be resized to 1000 x 600. The way to resize is the same in both Windows and Mac. Grab the lower, right hand side of the GUI with the 3 diagonal lines and push or pull to resize. In Windows if you can’t get to this lower right hand corner, you may need to temporarily turn off your Quick Launch toolbar or use it in the auto-hide feature. I have included a snapshot corner with the 3 lines on it to the right. For larger screens, you may want to take advantage of the screen to see a bigger image. You can do this in several ways. The first is to use the full size icon in the upper right hand corner of the user interface to maximize. This is next to the minimize and close buttons. In addition, you have the option to COLLAPSE the top and/or bottom menu areas by using the collapse button found on the far right hand size of the GUI. This button is a small black square with a gray arrow inside of it. The only downside to maximizing the video size may be its quality. If you are dealing with a smaller or older video, resizing it may result in lower quality, especially if you have a very large screen. Video Surgeon preserves the quality of whatever file you open, so if the quality is lessened when you view it in Video Surgeon it will be do to the fact you are resizing to a larger frame size than the original video. We have made many changes over the past few months to correct bugs and modify other functions for user convenience. If you don’t have the latest version which is 2.0.0.797 you might consider downloading and installing it. You can always find the most recent builds in the Downloads section of the Help Desk. YouTube and other video sharing sites are some of the most popular sites on the World Wide Web. Unfortunately for music lovers and musicians, these sites don’t accept audio files. For audio or music files to be uploaded to YouTube (or Facebook) you must first make a video that incorporates the audio. There are many software programs available for creating videos, some are quite sophisticated, expensive, and difficult to learn. Others are less expensive and simpler, but still require a modest learning curve. But….. creating a video using SlideTrax is a dunk shot! You can’t miss! SlideTrax is an inexpensive software program that is very simple to use. It effortlessly allows you to create a video using an audio file. In fact, it is so easy to use that it almost completely circumvents any learning curve. All you need to be able to do is Drag and Drop an audio file, image (picture) file, and perhaps include some optional text that you’d like to appear. Your video has been created and is now ready for sharing! If you’re not a musician that’s okay. There are a ton of uses for SlideTrax outside of the music field. Regardless of whether you have a library of songs you’d like to share or a: speech, presentation, audio transcript, conversation, sound effects, oral histories, the sounds of nature, wildlife recordings, etc. , you can create a SlideTrak for any and all these. p.s. Here is an copy of an email we recently received from one of our customers. It demonstrates the type of diversity of use we are looking to catalog in the “Unique Uses” program mentioned above. I practice Tai Chi very seriously and, with your software, I have been able to improve my form. There are many intricate moves within each form that I was not able to detect with other software. For me your software has been a good investment. You ask for suggestions for future software improvements. I have one. I am using videos that are not HD and if you could incorporate math coprocessors to upgrade the video that is imported this could add even more to the detail that could be extracted from the video. I know this would be a big undertaking, and in the future HD video will in many instances become more common, but I know that many people would like to view older videos in a higher resolution. Once again thanks for a great product. With the launch behind us, let’s get down to business with some practical tips for the use of Video Surgeon. Watch for these in our weekly video tips segment of this newsletter. The .vob files found on DVDs can be as large as 1Gb in size. These file can often take 5-10 minutes to rip from the DVD and then another 5-10 minutes to import and open in Video Surgeon. On older computers it may even take longer. We have assembled a series of tips and suggestions to assist you with your use of video from DVD’s. We will cover these tips in the next several newsletters in this Weekly Tip’s section. The first of these on ripping vs. opening a DVD (.vob) file. 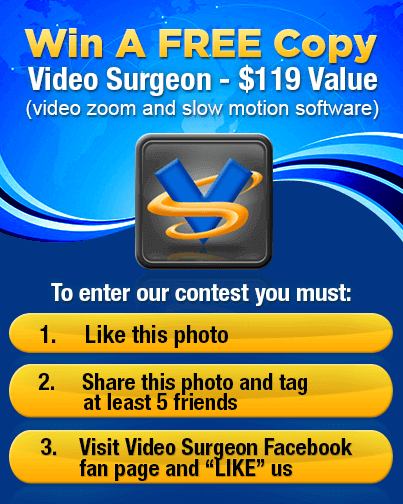 I want to thank you for your interest and purchase in Video Surgeon. Both the Windows and Mac version launches are now complete. I want to apologize if you received multiple emails about the launch. There is a method to the madness as they say. Only about 10-15% of all emails are ever opened. This means we need to send an email 6-7 times to ensure that everyone sees it. And even after sending many emails we’ll hear from people over the next days and weeks telling us they never received a notification of the launch. Below is a video that one of our Spanish language customers made about Video Surgeon. It briefly describes how he uses Video Surgeon. p.s. Here is another recent customer email about Video Surgeon we received. The effective performance level of VideoSurgeon, is much more than adequate,to meet the critical standards of any modern digital Recording Studio, – and provide a Commercial Product 100% awesome. The rest or balance of the features included in the Application, are simply an incredible bonus, and would be the best $100.00 investment any solo/artist, – singer /songwriter could possibly make in the contemporary performance industry of to-day. Regards and Best Wishes to the Team. We are about 1/2 through the launch of the Mac version of Video Surgeon. Several bugs have been reported and most of these have already been resolved but there are a couple we are still working on. There will be a software update later this week, likely within the next 24 hours, to fix most of these issues. The update will be for both Mac and Windows versions. I would suggest you download this update so you have the newest version which will contain the bug fixes. You should be notified of these updates when you open the program, and should be able to update directly from the program prompt. Alternatively the new versions, when they are released, will be posted on the Downloads Section of the Help Desk. Video Surgeon For Mac Launch is half over! The launch period is already have over and will expire at the end of the month. In addition, we have released a special Dual OS option if you’d like to buy Video Surgeon and run it on both Mac and Win machines. You can buy this option for $19, which of course is in addition to your purchase of either the Win or Mac version. Requirements: Intel processor, 10.6.8 or newer OS. License to activate on up to 3 mac machines at any one time. Looping: Unlimited number of looping areas can be created. YouTube or thousands of other sites. Who should use the product? Anyone that uses video in their teaching, learning, lessons, or instructions will find Video Surgeon to be great asset, regardless of their field of endeavor. home page and watch the overview video at the top. If you are a Face Book user you should consider entering our contest to win a free copy. Don’t worry, if you buy the product and end up winning a free copy, we’ll gladly refund your money. The mechanics of the contest are reprinted on this contest graphic. Click this graphic and go to our Face Book page and follow the instructions to enter our contest to WIN a free copy! We are beginning to get questions about video quality. Video Surgeon maintains video quality, so essentially whatever you put in is what you get out. That means you need to strive to find high quality videos to use in Video surgeon. This week’s video tips provides some practical suggestions on how to do this. p.s. It’s not what we think of Video Surgeon that is important but rather, what you think. Here are a few comments that have come in that will give you a flavor of what customers are telling us. VS 2 is the bomb! As you may recall, I’ve had difficulty with the sniffer on previous versions, in particular with YouTube music videos. VS 2 has solved all my problems and then some with the new YouTube sniffer and all the added features. I especially like the vastly improved option to slow down music passages. Keep up the good work! Video Surgeon is an AWESOME product! I own the first version, and everything that I thought should be better in the first version was made MUCH BETTER in the second version. It really has blown me away. I will definitely be purchasing version 2 in the (hopefully near) future, but right now money is tight and some household projects must take precedence (I hope I spelled that right). I look forward to doing business with you again. And again, GREAT JOB on version 2! I love the program. It is an incredible help to learning guitar. Thanks. I own Song Surgeon also. Both programs are GREAT! I use video surgeon for dance moves (tango) and Tai Chi. I like the slow down, loop and freeze frame features. One thing that I would like to see as an improvement would be to have the capability to export the sound track alone That makes the music portable, useable in any mp3 player, for dance practice away from a PC. Video Surgeon For Mac is NOW available! If you opened last week’s newsletter you know that Video Surgeon for Mac is now available. Last week we kicked things off, by offering a sale price on Version 2 equal to what the Windows version was sold for at launch. That price was $84 and change. As we normally do when we launch a new product, the special pricing we offer applies to all version and models. That means if you are a Windows users and have been waiting for a sale before buying, now is a great time to buy. I don’t expect to repeat this price again until perhaps Christmas of 2014. Please use the link below to go to our shopping cart and view the pricing and options. Finally, it is here. The Mac version of Video Surgeon is now available. It is identical to the Windows version so anything you have read here previously about the Win version will be applicable to the Mac version. To learn more I suggest you go to our home page and watch the overview video at the top. Shortly after the launch of the Windows version concluded, we increased the price of Video Surgeon. However, in response to multiple inquiries from Mac users I promised to sell the Mac version for the same price as the Windows version was sold at launch. That price is $84.95. The current retail price for the product is $119, so I’d encourage you to buy Video Surgeon now if you are interested because once this launch period ends the product will revert to its full retail price- and you’ll pay a lot more for it ($34 savings). Q. On installing on my Mac machine, I see a message that says Video Surgeon can’t be opened because it is from an unidentified developer. What do I do? p.s. This email about Video Surgeon recently came in.